This morning I had no intentions of making a card today, but then I found a color challenge that changed my mind. The challenge comes from Sunday Stamps and the colors are: Whisper White, Daffodil Delight, and Basic Black. When I paused to think about this challenge, I realized I'd never made a card with just these colors before. The design for this Betsy's Blossoms Hello Card is fairly basic, it's the details that add interest. 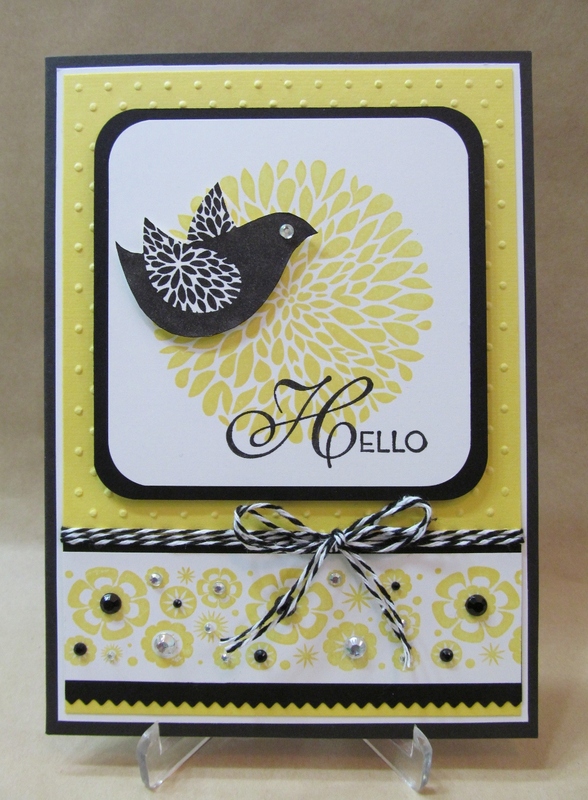 Twine, rhinestones, and the cute little bird help to liven things up on this card. Have a great evening and thanks for stopping by! Paper: Whisper White, Daffodil Delight, and Basic Black card stock. Stamps: Betsy's Blossoms, Betsy's Blooms stampin' wheel, and Lacy & Lovely (Hello sentiment). Inks: Classic stampin' pads in Daffodil Delight and Basic Black. Other Stuff: Big Shot, Finishing Touches Edgelit, Dotted Swiss embossing folder by Cuttlebug, black twine (source unknown), rhinestones by Recollections, and stampin' dimensionals. *All supplies by Stampin' Up! unless noted. BEAUTIFUL!!! Great job Andrea. Glad you made this card with these colors for the first time. Thanks so much for playing along with us with week at Sunday Stamps, hope you will play again. Totally fun card! I haven't used this set in a while and I love how you added the bling for the centres of the flowers. Thanks for joining us at Sunday Stamps this week. Beautiful! Love the trendy color scheme. :) Thank you for joining the "Anything Goes" challenge over at the Simon Says Stamp challenge blog! Your card is gorgeous! I love all the detail you added with the baker's twine & rhinestones. So glad we were able to inspire you to make a card and hope you'll play along with us again soon over at Sunday Stamps! Stunning card, love those colours together, so modern! Lovely card Andrea. Thank you for playing along with the ATS&M challenge this week.